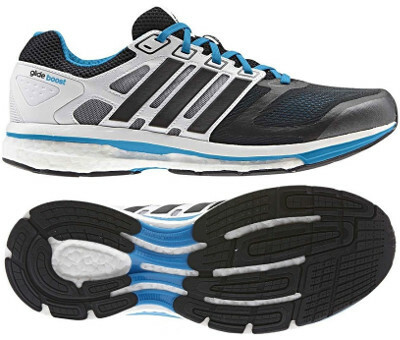 Adidas Supernova Glide Boost are neutral cushioned running shoes. The Adidas Supernova Glide Boost is one of the most popular model for neutral runners who enjoy long distances, definitely a best seller. Due to its characteristics, it fits between the premium Adidas Adistar Boost and simpler but with great price for value Adidas Sonic Boost. The Supernova Glide Boost are pretty similar to the Adidas Energy Boost 2 but featuring less cushioning, a more relaxed fit in the upper and last but not least, cheaper. It does not make really sense to compare the Glide Boost (also known as Glide 6) with its theorical predecessor within Supernova family from the german brand (Adidas Supernova Glide 5) because it is a completely new shoe. It is interesting to highlight the thin EVA layer between Boost compound and toebox which provides a firmer stride and more reactive response. Outsole has been engineered in partnership with the recognized tyre manufacturer Continental™ that guarantees outstanding grip even on wet conditions.